For companies that invest in CNC router equipment to manufacture cabinets, furniture components, countertops and other wood, metal and plastic products, initial and ongoing CNC router training is essential. To be effective, training begins at a basic level with how to setup the router table correctly. Determining how to program a router path to cut the materials specified—at the correct feeds and speeds, within the desired tolerances—is a skill that often takes some time to master completely. Next comes instruction for getting production up and running. At a later date, more advanced training may be required. The typical learning curve for operators can range from three to six months, which is important to consider when looking for ROI and productivity of CNC equipment. The reality is CNC router training is not a one-time event. Suppliers and buyers need to work together on a continuous basis so that operators become as proficient as possible. Operators need access to equipment manufacturers who answer technical and production questions in real time. Shop owners need to know their suppliers will assess ongoing training needs, determine where problems are occurring and how often, decide when to teach advanced capabilities, reinforce how to perform routine maintenance and provide other support services. Allotting the initial time to train and investing in additional guidance when needed can help avoid unnecessary downtime and keep scrap to a minimum. Understanding the value of complete CNC router training versus the lure of taking shortcuts to resume production is important. To do this effectively, work to minimize distractions on the shop floor when vital training on CNC router equipment is in process. Make sure operators are taking notes, have access to training materials, and that they are asking questions when training gets complicated or too detailed. In addition, test their knowledge and observe them to determine how much of the training they have absorbed and are using on the job. Sometimes when shops purchase second-hand equipment, there’s a tendency to just want to get up and running after thumbing through a dog-eared manual that came with the equipment. That’s a mistake. A better alternative is to consider the money saved by purchasing used equipment and allocate it to training. Even if it’s an added expense, the cost of machine downtime or scrap that occurs because employees are just “winging it” far outweighs the expense of training. Focus on these tips when implementing CNC router training. Master the basics first: Take full advantage of the training provided by CNC router equipment manufacturers up front. Don’t let them out the door until their time on site has yielded maximum results. Run real jobs: Make sure the trainers and the employees run real production jobs together or two side-by-side before they leave. In that way, they can ensure everyone is up to speed. While there are some basics, training on a CNC router needs to be customized for each unique environment due to the wide variety of materials used by end-users. What may take two days at one shop for training may entail a week somewhere else. Online training anytime: Even before the manufacturers’ trainers arrive, seek out online resources available, typically for software training. Afterwards, look for the ability to attend vendor-sponsored webinars or receive other advanced information from suppliers. Train more than one person: Employees get sick; they go on vacation or leave the company for other opportunities. Make sure there is a backup plan, so that even those not directly responsible for programming or operating a CNC router can step in without missing a beat. Remember, downtime or loss of productivity impacts the bottom line. A machine that’s not cutting is not making money. With any tool or equipment, training that helps increase productivity, upgrades the quality of finished pieces, and ensures operator safety is well worth the time and money. Since investing in a CNC router is often a six-figure commitment, engaging in proper training and keeping operational knowledge up-to-date are critical. That’s why shop owners need to select a CNC router manufacturer that has state-of-the-art training programs and the best in-house customer support available. 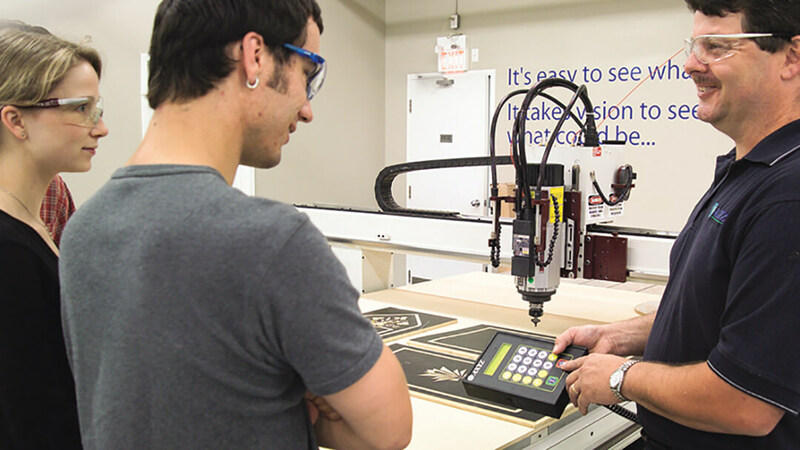 Visit our Service page to learn more about AXYZ CNC router training and support programs.